Four kids, a mini-van and a lot of love: Undercover Mama Giveaway! When I was pregnant with Blake, I was searching the web for nursing tanks. I was looking for something long, to cover my tummy and without a shelf bra built in. I really didn't find anything that I liked. The next day I checked my email and I had an email from Plum District for an offer from Undercover Mama. I clicked on it and, low and behold....the perfect nursing tank! Not only is this nursing tank top long, and covers my belly and then some, it doesn't add extra straps to your shoulders. How is that possible?! The nursing tank comes with loops and a clap that attach right to your nursing bra. 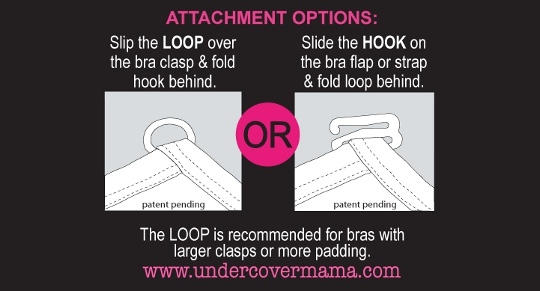 Depending on which fastens easier to your nursing bra. I wear one just about everyday. I LOVE them! I have black and white, since they go with everything. I would recommend this to any nursing mama. They wash great, I bleach my white one and it holds up great too. This is a genius idea and an awesome product....the only thing better, would be if I would have come up with the idea. Undercover Mama is giving away a $25.00 gift certificate to one of your lucky readers. 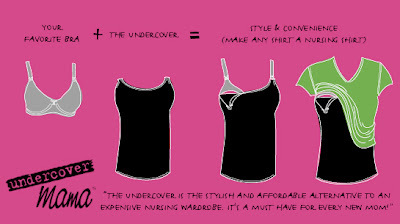 Go check out Undercover Mama and let me know what you think of their tanks! Oh, these would have been great when I was nursing! I'll have to check them out if we have more kids. Love your blog...thanks for visiting and leaving such nice comments. Looking forward to following!